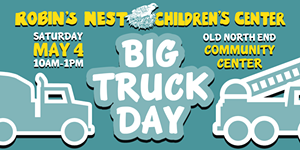 Big Truck Day | One Community Center | Fairs & Festivals | Kids VT - small people, big ideas! When: Sat., May 4, 10 a.m.-1 p.m.
Price: $3-5; food and face painting available for a fee; proceeds benefit the Robin's Nest Children's Center. Beep, beep! Little ones check out the drivers' seats in fire trucks, dump trucks, motorcycles, tractors, a cement truck and more. Horn free until 11 a.m.